Secretary of Education Betsy DeVos, who wanted to defund the Special Olympics and then “correct[ed] the record” by confirming that she indeed wanted to defund the Special Olympics, is having a tough week, but that seems deserved given that she wanted to defund the Special Olympics. 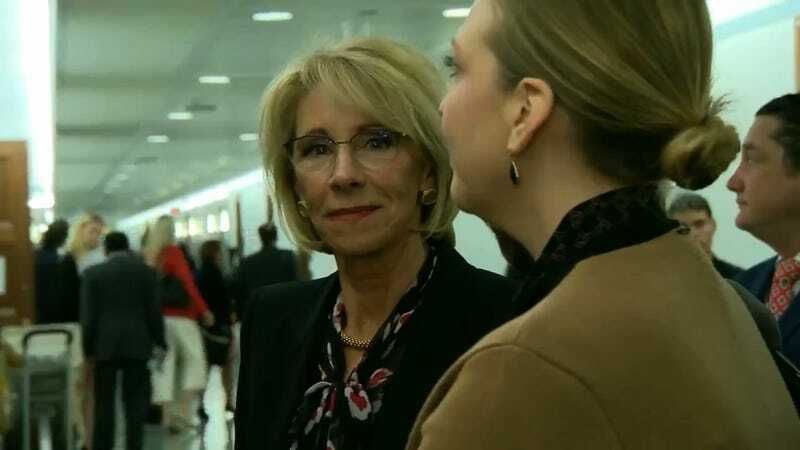 Today, CNN reporter Ryan Nobles caught DeVos on her way to the elevator and asked her to explain more about her proposed budget that would defund the Special Olympics. She didn’t say anything and at one point vacantly looked into the camera with a smile on her face. Or maybe her default setting is dumb yet condescending. Roughly an hour later, Donald Trump said he had “overridden my people”—the Special Olympics will not lose its federal funding. Keep in mind that this proposed budget had basically no chance of being passed by Congress anyway. Very quickly, DeVos released her own statement praising Trump for not defunding the Special Olympics, even though just this morning she had once again defended her proposal to defund the Special Olympics, the proposal that most likely wouldn’t have passed anyway. The only thing that was accomplished in this entire process is that everyone now knows Betsy DeVos would love to defund the Special Olympics if she had the power to do so. This country would be better at keeping politicians accountable if we started threatening to throw them into dumpsters.